EventLog Analyzer is a tool that retains log data generated by network systems, devices and applications in a centralized repository. It encrypts the log data to ensure data is secured for forensic analysis and compliance audits. The archived data is hashed and time-stamped to display evidence that the logs have not been tampered with. At the same time, EventLog Analyzer collects log data from agent and agentless data sources (typically from syslog or WMI sources). By default, the tool uses a PostgreSQL database (users can choose other databases, such as My SQL or MS SQL depending on the needs). The system also enables log import from a local/remote host through HTTP/HTTPS and FTP. This event log analyzer software helps to monitor file integrity, conduct log forensics analysis, monitor privileged users and comply to different compliance regulatory bodies by intelligently examining your data logs and immediately creating several reports on user activity, historical trends, and more. With it, you can be sure that data is 100% protected and regularly updated both from internal and external threats. To make matters even better, EventLog Analyzer is a quote-priced system, where all users receive a specially-tailored plan that meets their specific requirements and budgets. 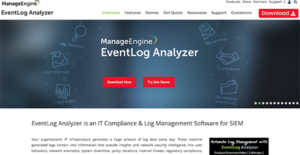 How does EventLog Analyzer benefit your business? For one, The ManageEngine EventLog Analyzer comes loaded with the tools and functionalities you would expect in a security information and event management (SIEM) system. Plus, the software works seamlessly with over 700 devices from 30-plus vendors, which means you can easily integrate the software to your existing setup and not build your systems around it. Many users love how easy and fast the initial setup is, with the whole process being completed in 30 minutes or less. For users who require guidance, you can find tons of useful resources in the company’s official website. The intuitive interface helps even non-savvy users get grasp of the system in few hours, which makes EventLog ideal for startups and small, inexperienced teams. Straightforward interface makes navigation easy, as it uses an icon-base graphic dashboard that simplifies access to most features and functionalities. EventLog Analyzer also simplifies compliance by offering a useful set of predefined reports that address several compliance requirements (PCI-DSS, FISMA, SOX, ISO 27001 and HIPAA), user activity reports, privileged user monitoring and auditing (PUMA), failed logons, object access and more. For added flexibility, users can create their own reports based on criteria that they have specified. Security is crucial to keep your IT network, systems, and devices functioning smoothly. EventLog Analyzer helps you achieve real-time event correlation across your entire IT infrastructure. The software comes wit more than 70 out-of-the-box event correlation rules that help you manage and instantly address threats to your network. EventLog Analyzer can spot areas where attempts to breach has been made and identify threats from insiders and more, with all these processes automated. Log collection is fast and easy. EventLog Analyze can gather logs from multiple sources and can decipher log data quickly, no matter the source and log format. From a centralized hub, users can easily monitor updates and receive alerts in real time whenever files and folders are created, accessed, viewed, deleted, modified, renamed, etc. Every business is different, and may call for a particular type of IT Management Software solution that will be designed for their company size, type of clients and employees and even particular niche they deal with. You should not count on getting an ideal software that is going to be suitable for each business no matter what their background is. It may be a good idea to read a few EventLog Analyzer reviews first and even then you should remember what the software is intended to do for your business and your workers. Do you need a simple and straightforward service with just elementary features? Will you actually use the complex tools required by pros and big enterprises? Are there any particular features that are especially practical for the industry you work in? If you ask yourself these questions it is going to be much easier to locate a reliable software that will match your budget. How Much Does EventLog Analyzer Cost? We realize that when you make a decision to buy IT Security Software it’s important not only to see how experts evaluate it in their reviews, but also to find out if the real people and companies that buy it are actually satisfied with the product. That’s why we’ve created our behavior-based Customer Satisfaction Algorithm™ that gathers customer reviews, comments and EventLog Analyzer reviews across a wide range of social media sites. The data is then presented in an easy to digest form showing how many people had positive and negative experience with EventLog Analyzer. With that information at hand you should be equipped to make an informed buying decision that you won’t regret. What are EventLog Analyzer pricing details? What integrations are available for EventLog Analyzer? If you need more information about EventLog Analyzer or you simply have a question let us know what you need and we’ll forward your request directly to the vendor.